A massive search for a 10-year-old who went missing Thursday in Kotzebue continued Sunday with no sign of the girl. Ashley Johnson-Barr was last seen at the Rainbow Park playground at about 5:30 p.m. on Thursday. Her family reported her missing when she didn't come home. 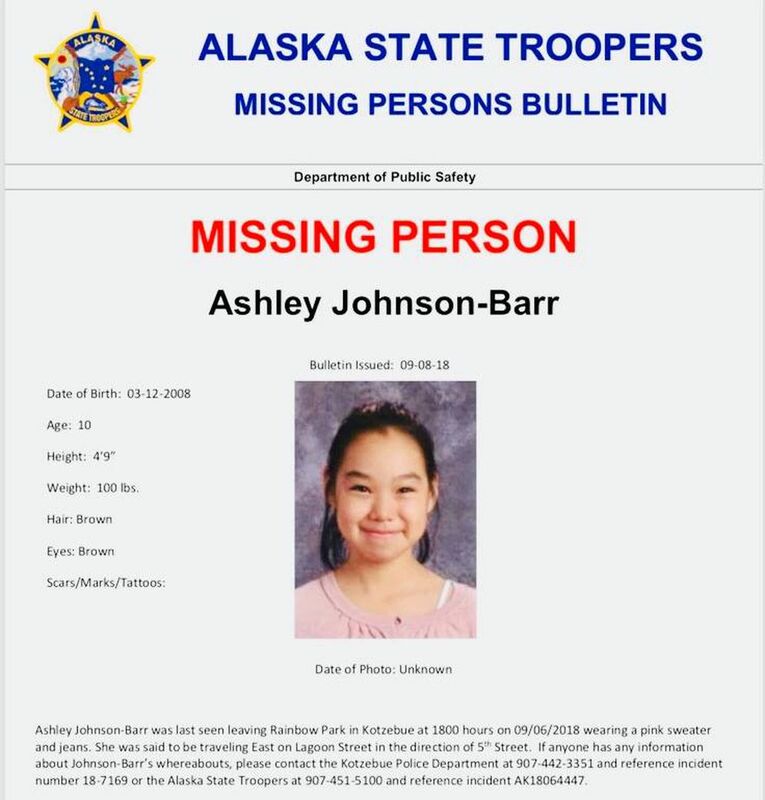 Kotzebue police, volunteers and local search and rescue groups spent Sunday looking for Ashley. The Alaska State Troopers are involved in the search but not in charge of it, said spokeswoman Megan Peters. The Alaska Incident Management Team, a statewide emergency response group, arrived on Saturday to assist with the search. In a written statement, Kotzebue police chief Thomas Milliette said officers had found the girl's cellphone "in the street" about a half mile from the park, in the opposite direction of Johnson-Barr's house. The Northwest Arctic Borough asked on Facebook Sunday for additional volunteers willing to search on foot for the girl. "Please continue to keep Ashley and her family in your thoughts and prayers," the post said.